Photo by: courtesy of Tesla Inc.
Loup Ventures analysts Gene Munster and Will Thompson write that Tesla will likely cash flow positive in Q3 and may even be slightly profitable. Tesla appears to have hit a major milestone that could signal the electric-car company is about to punch the accelerator. The Silicon Valley upstart outsold long-established German luxury automaker Mercedes-Benz during the July-September period in the U.S., Jean Baptiste Su, principal analyst with Atherton Research, says in a report in Forbes. And the company could soon outsell another venerable car maker, he says. 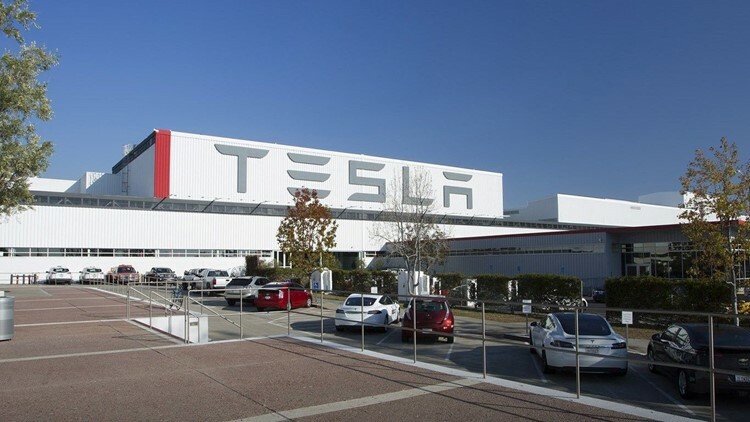 Tesla would not confirm Atherton Research's sales estimates. As the Palo Alto, California, high-tech automaker hits its production stride, it hopes to cement itself among the heavy hitters in luxury vehicles. "When they were just producing the model S and X, they were a niche automaker that really didn’t strike fear into the hearts of automakers," said Jeremy Acevedo, manager of industry analysis for website Edmunds.com. "But now with the Model 3 hitting its production stride they are eating some of these manufacturers' lunch." The Model S and X vehicles, which can cost more than $100,000, have been status symbols. But the Model 3, which typically runs about $55,000 out the door, has put Tesla on the radar of average car buyers. Tesla's ascension is not surprising, said Akshay Anand, executive analyst for Kelley Blue Book. "Tesla has done a wonderful job building its brand and creating buzz, so much so that it almost seems to transcend automotive at times and enter the ‘lifestyle’ brand fray along with the Googles and Apples of the world." Despite a bumpy month or so for Tesla CEO Elon Musk, the electric-car company could be hitting a straightaway. Tesla sold 69,925 Model 3, S and X cars in the U.S. during the third quarter, compared with the German automaker's 66,542 vehicles (excluding commercial vans), says Su, who is also a tech columnist for Forbes. And in this current quarter, Tesla may be able to surpass another rival, BMW, which sold 71,679 vehicles in the third quarter, he says. "It was just a matter of time" before Tesla caught up with Mercedes-Benz, Su says. And as the company's lower-priced Model 3 base version ($35,000), becomes available -- which is expected later this year -- "all the other manufacturers, with all-electric, hybrids and plug-in hybrids (such as Nissan, Toyota/Lexus, GM/Cadillac, Ford, Chrysler) will be impacted," Su says. This success is possible because Tesla has smoothed out its production line. During the third quarter, Tesla says it delivered 83,500 vehicles – more than 80 percent of the vehicles that the company delivered in all of 2017. Its quarterly production of 80,142 vehicles during the three-month period was twice that of its previous high in the April-June quarter. Tesla had hinted it was gaining on the competition when it came to sales. The automaker said its Model 3 outsold all other mid-sized premium sedans combined (Mercedes-Benz, BMW, Audi, Jaguar and Lexus) in July in the U.S., capturing 52 percent of the segment overall. "We think they have the best product in the market of all electric vehicles. It's really not even close," said CFRA Research analyst Garrett Nelson. "But a lot of competitors are catching up rapidly, so we expect them to face a lot more competition over the next couple years." Tesla said it had a backlog of reservations for the Model 3 of about 420,000 at the end of the second quarter. Having vanquished the longtime enemy of electric vehicles, "range anxiety," by achieving 300 miles on a battery charge, Tesla's dominance in batteries and in smart, autonomous and connected vehicles could help its Model Y crossover and pickup truck, both in development, challenge other vehicle makers such as Ford and GM, Su says. For Musk, things haven't been running as smoothly. Two weeks ago, he agreed in a settlement with the Securities and Exchange Commission to leave his position as Tesla chairman for three years and pay $20 million for making a "false and misleading'' statement when he tweeted Tesla had enough financing to go private. Under the settlement, Tesla will also add two new independent directors to the company's board. Musk, who remains CEO, also caused a stir last month when he smoked what host Joe Rogan described as marijuana inside of tobacco a live video podcast interview.